Next week marks what most of us consider the real Opening Day for MLB. So it’s time for a look at what was going on Opening Day 100 years ago. As the American League contained the World Champion Athletics, I think I’ll start with them (having done the “outlaw” Federal League already). The champion A’s were much the same team as the 1913 version with the $100,000 Infield in place (Stuffy McInnis, Eddie Collins, Jack Barry, and Frank Baker). The outfield was still decent and in Wally Schang the A’s had a good catcher. They led the AL in hits, runs, home runs, RBIs, and average. The Athletics used a dominant pitching staff to rule the A for five years, but it was beginning to fray. Jack Coombs was gone (he pitched only 2 games), Eddie Plank was 38 and not aging well. Herb Pennock had five starts over the previous two years, while Bullet Joe Bush had all of 17. As a consequence, the A’s would have 24 shutouts, but lead the league in no other category. They were fourth in ERA and hits allowed. Two teams would give them a run for their money. One was Washington. The Senators finished 19 games back, but they had Walter Johnson who led the AL in wins, shutouts, and strikeouts. The greater challenge came from Boston. the Red Sox still had Tris Speaker, Duffy Lewis, ad Harry Hooper as their outfield. Speaker led the league in hits and doubles. Pitcher Dutch Leonard went 19-5 with an all-time low ERA of 1.00 (try losing five games with that ERA). 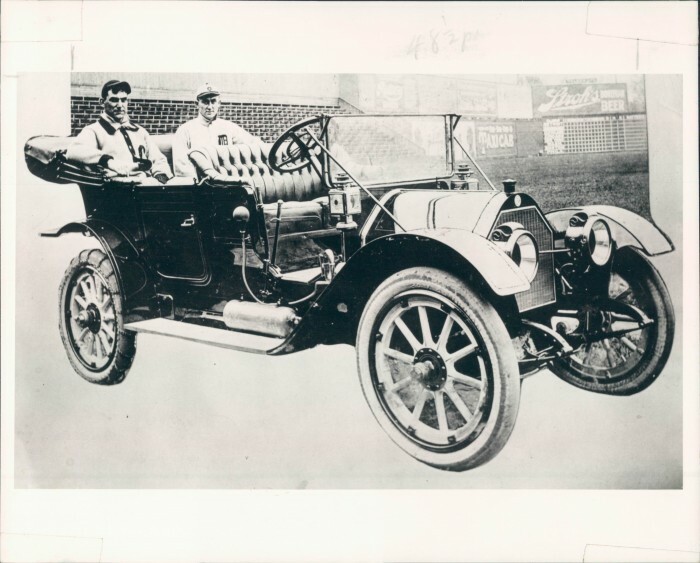 But the most important news at Boston and for baseball in general was the arrival on 11 July of a rookie pitcher from Baltimore with the nickname of “Babe” Ruth. He would go 2-1 over four games (three starts), but it was the beginning of the most famous of all Major League careers. 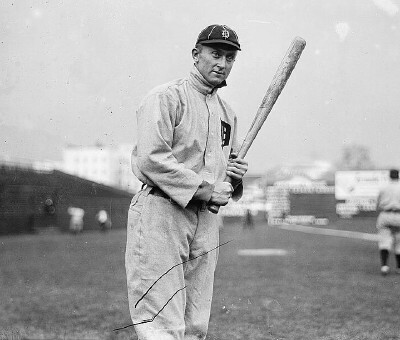 Around the rest of the AL, Ty Cobb again won a batting title (.368) and the slugging crown (.513). 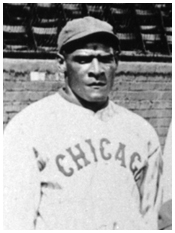 His teammate Sam Crawford led the league in RBIs and triples. Fritz Maisel, a third baseman for the Highlanders, won the stolen base title with 74 and Baker with the A’s copped the home run title with nine. 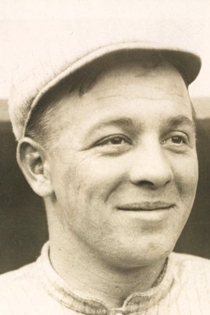 In April future Hall of Fame pitcher Red Faber made his debut for the White Sox, while Fred McMullin, one of the 1919 Black Sox (and Faber teammate) played his first big league game with Detroit in August. The 1920s stalwarts Everett Scott and Jack Tobin also first show up in 1914. Finally, 1914 is the rookie campaign for Bill Wambsganss, famous for the only unassisted triple play in World Series history (1920). In the World Series, Philadelphia would be mauled by the “Miracle Braves” of Boston. It would be the end of Connie Mack’s A’s dynasty (he’d put together another in 1929) and the arrival of Ruth would signal the start of a new dynasty. This one in Fenway Park. 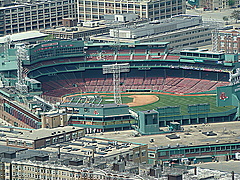 As most of you know, the Boston Red Sox won the 1912 American League Pennant, their first since 1904. Then they went on to win the World Series in dramatic fashion. Their outfield of Duffy Lewis, Tris Speaker, and Harry Hooper consistently ranks as one of the premier outfields in Major League history and is frequently ranked as the best in the Deadball Era. With an outfield like that the backup outfielder tends to get lost in the shuffle. Olaf Henriksen, the backup in 1912, is one of those, even though he had a critical hit in the final game of the 1912 World Series. Henriksen was born in Denmark in 1888, the only Major Leaguer born in Denmark. He was still young when his family arrived in the United States. He discovered baseball, liked it, and best of all was good at it. He joined the New England League team in Brockton, Massachusetts and by 1911 was with the Red Sox. He was the backup outfielder in an era when there tended to be only one. He was considered primarily a left fielder (Lewis’s replacement), he actually played very little in the field, becoming something of a specialty pinch hitter. He was good at it, managing a .449 OBP in 1911, still the second highest OBP by a rookie in the 20th Century. He surpassed that in 1912 with an OBP of .457, and set his career high in 1913 with an OBP of .468. A left-handed batter (and thrower), Henriksen had little power, hitting one home run in his entire career (1914). In only 487 at bats he walked 97 times, struck out 73, scored 84 runs, and had 48 RBIs. He managed 22 games in center field, 42 in left, and 61 in right field with 31 games in the field in 1916 being his high, much of his field work coming after the trade of Speaker to Cleveland. Despite being from Denmark, he was nicknamed “Swede”. Apparently that was a generic nickname for Scandinavians in the era. As far as I can tell, Henriksen never went out of his way to correct others concerning his origins. He seems to have been both well liked and relatively quiet. His big moment came in the final game of the 1912 World Series, when he slugged a pinch hit double in the seventh inning tying the score. Boston ultimately won the game and the Series in extra innings. It was his only at bat of the Series. His career was short, ending after the 1917 season. He hit .083 with an OBP of only .267. He was 29 and through. After a couple of years and a few odd jobs, he picked up the coaching job at Boston College. He managed the team from 1922-1924. Henriksen is one of those players that go lost in the mists of time. But he was the kind of player that teams need in order to win consistently. He got on base a lot, made the most of his playing time, and was one of the pioneering career pinch hitters. You see that last quite a lot now. Guys like Manny Mota made their name pinch-hitting. Henriksen was, in some ways, their grandfather. Today marks the 100th Anniversary of Opening Day in 1912. It was a different world then. William Howard Taft was President of the United States (although Woodrow Wilson would win the election in November). Most people still rode the train or horse and buggy. Wyatt Earp and Cole Younger were still alive, as was the Archduke Franz Ferdinand of Austria whose death two years later would spark a World War. Al Capone, Frank Nitti, and Elliot Ness were nobodies. Irving Berlin and Scott Joplin were writing ragtime music and Geroge Gershwin was still four years from publishing his first song. No one had ever heard of John Wayne and Mae West was just getting started on Broadway, but Mary Pickford was America’s darling and Lillian Gish was just beginning a career that would make her a great star. She’d hitched her ambitions to a genius named D.W. Griffith who was starting to toy with the idea of making a movie two hours long, an unheard of length for a “flicker”. Molly Brown wasn’t yet “unsinkable” because the Titanic was still three days from be introduced to icebergs. George Gipp (of “win one for the Gipper” fame) had yet to play a down for Notre Dame and Babe Ruth had not yet appeared in a Red Sox uniform. For Boston, 1912 would be an exceptionally good year. Down 2-1 in the ninth inning, the Red Sox would storm back to win on Opening Day. By the end of the season they would win 105 games, finish first by 14 (over Walter Johnson and the Senators), then win a famous World Series over the Giants four games to three (with a tie). 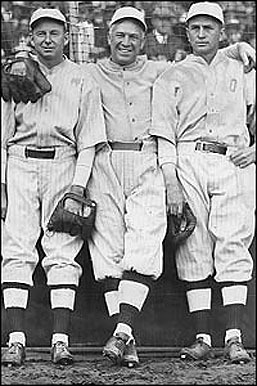 The outfield of Duffy Lewis, Tris Speaker, and Harry Hooper is considered one of the finest, if not the finest, Deadball Era outfield. Both Speaker and Hooper eventually made the Hall of Fame. 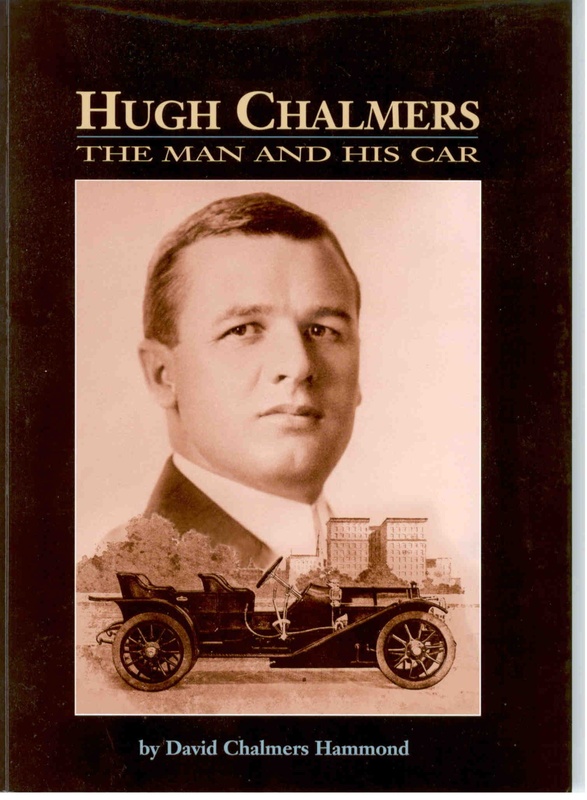 Although Hooper had a down year in 1912, Speaker was tremendous and Lewis had a fine season. Jake Stahl managed and played first. He joined Speaker and third baseman Larry Gardner as .300 hitters. Steve Yerkes and Heinie Wagner rounded out the infield and Bill Carrigan did the bulk of the catching. Joe Wood hit .290 and won 34 games. Hugh Bedient and Buck O’Brien both won twenty and Charley Hall and Ray Collins (not the old actor) won in double figures. The National League saw the New York Giants score 18 runs and pound out 22 hits as the started the season with a victory over Brooklyn. John McGraw’s team would win 103 games and finish 10 ahead of Pittsburgh. As with most McGraw teams, it was the pitching that stood out. 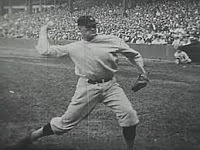 Christy Mathewson won 23 games and walked only 34 in 310 innings of work. 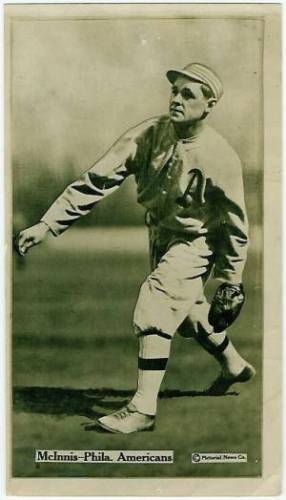 Lefty Rube Marquard won even more games with 26, while Jeff Tesreau, Red Ames, and Doc Crandall won between 11 and 17 games. Tesreau managed to cop the ERA title. In the field, catcher Chief Meyers had a terrific year, hitting over 350, winning an OBP title, and slugging almost .450. The infield of Fred Merkle, Larry Doyle, Art Fletcher, and Buck Herzog (first around to third )feathured two .300 hitters and two men with 10 or more homer runs (Merkle and Doyle in each case). The outfield featured Fred Snodgrass, who would make a memorable gaffe in the World Series, Josh Devore, Beals Becker, and Red Murray. None of them hit .300, but Murray slugged over .400. Other noteworthy achievements of the season in the NL included Heinie Zimmerman winning the NL batting, slugging, home run, and OPS titles. Honus Wagner picked up the RBI title while Cincinnati leftfielder Bob Bescher swipped 67 bases to win the stolen base crown. Larry Cheney tied Marquard for the league lead in wins while Grover Cleveland Alexander picked up the strikeout title with 195. Nap Rucker of Brooklyn and Marty O’Toole at Pittsburgh each had six shutouts. The league lead in saves was six, turned in by Slim Sallee of the Cardinals. The Chalmers Award (the 1912 version of the MVP) went to Larry Doyle over Meyers (got me). In the American League Ty Cobb hit .409 to win the batting title. He also picked up slugging and OPS titles, while Speaker won the OBP title. Frank Baker won the home run title and tied with Speaker for the RBI lead. Clyde Milan of Washington won the stolen base crown with 88 steals. 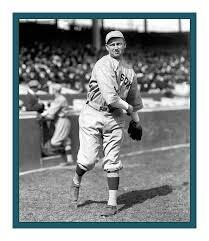 Walter Johnson won both the ERA and strikeout titles at the same time he put up 33 wins, one less than Wood. Wood also had 10 shutouts, while Ed Walsh at Chicago picked up 10 saves. It should not surprise you that Speaker picked up the AL’s Chalmers Award. When I think of the Deadball Era in baseball I generally think of three things: pitching, low scores, and base running. Our image of the era is of low scoring games with lots of stolen bases, gap power, and great pitching. As a rule that’s true, but there is another element that needs to be considered. The baserunners weren’t very good. Here’s a set of numbers for you: 185/182, 258/168, 276/157, 273/151, 194/131, 213/193, 247/184, 176/174. Those are the stolen base numbers for each American League team one hundred years ago (1912). The first number is the number of successful steal, the second number is the number of caught stealing. Percentages are as follows (teams in the same order): 50.4, 60.1, 63.7, 64.4, 59.7, 52.5, 57.3, 50.3. Not real good, are they? Now the kicker. These aren’t in order of finish in the league, but are in hitting order. Boston finished first and is listed first (50.4% success rate), but Washington, which finished second is listed fourth (64.4%). Detroit,which finished sixth is listed third (63.7%). So there’s not much correlation between stealing bases at a successful rate and winning a pennant. Boston finished next to last (the 50.3% belongs to St. Louis which finished seventh) while Detroit finished second in success rate, but ended the season deep in the second division. Selected players? Well, here’s a handful of well-known names. Tris Speaker stole 52, but was caught 28 times (a 65% success rate). 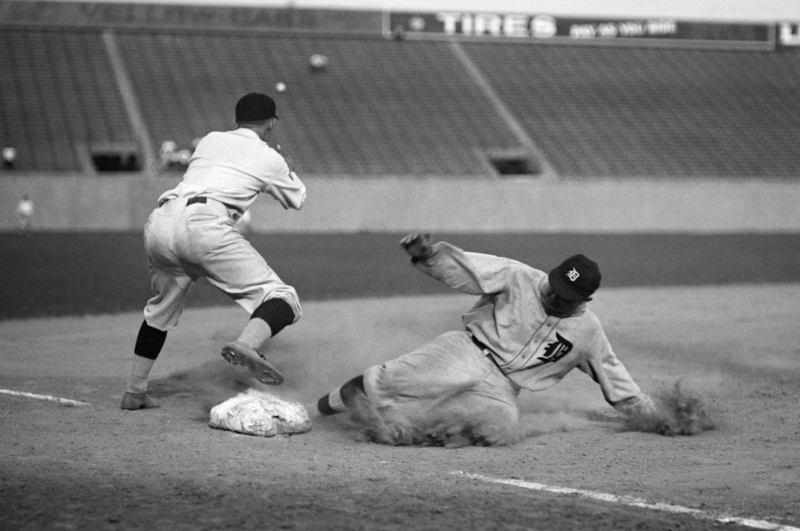 Ty Cobb stole 61 and was caught 34 times (a 64% success rate). Sam Crawford was 42 and 13 for a success rate of 76%. Eddie Collins is 63 and 22 for a 74% rate. And Clyde Milan, who led the AL in stolen bases was 88 and 31 for a success rate of 74%. Milan, Collins, Cobb, and Speaker were the top four in the AL in stolen bases for 1912. And before anyone asks, the caught stealing stats are incomplete for the National League in 1912. How’s this stack up against more modern players? using only three, Rickey Henderson had a 80.1% success rate, Luis Aparicio a 78.4% success rate, and Tim Raines as 84.7% success rate for their careers. All are better than the 1912 guys, but Crawford is close with the 76%. For the entire AL in the entire season the numbers are 1822 stolen bases and 1340 caught stealing for a 52.6% success rate. Ninety years late (2002) the numbers are 1236 and 579 for a 68% success rate. True the total numbers are down but we are in a power era when stolen base totals tend to decrease. As a check, I looked at 1911 and 1913. The stats were incomplete but what stats there were indicated that 1912 wasn’t out of line for the era. I acknowledge that this is only a three-year look at incomplete stats and that a more in-depth study might yield different results. What do I make of all this? A couple of things jump out at me. First, the guys who steal a lot of bases aren’t that much worse than their modern counterparts, but are below the newer guys when it comes to success. Second, the guys who aren’t great base stealers in 1912 are really, really awful. Take, for instance, the pennant winning Red Sox. Four of their primary starters actually had more caught stealing than successful stolen bases and one guy was at 21/20. A lot of other teams have similar numbers. Also, and this is a bit of a stretch, but you have to conclude that Deadball Era catchers had much better arms than we’ve been led to believe or a lot of pitchers had really first-rate pick-off moves. Further study could indicate how correct these conclusions are for the entire era. Today we baseball junkies get our November-February fix by engaging in what’s called “The Hot Stove League”. It was no different 100 years ago. Here’s a few things the 1912 American League fan had to be discussing in January 100 years ago. Could the Athletics repeat? The Philadelphia Athletics were two-time defending champions. Could they make it three in a row? No one ever had in the American League. We know the answer is “no.” Chief Bender had a down year, rookies Herb Pennock and Stan Coveleski (future Hall of Famers) didn’t do much (Coveleski only pitched 21 innings). If not, who could take them? 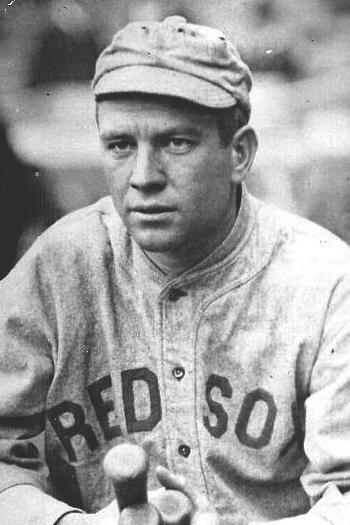 Boston had finished fifth in 1911, but Jake Stahl took over as manager (and had a good year at first base), the outfield of Harry Hooper, Tris Speaker, and Duffy Lewis became arguably the finest Deadball Era outfield, third baseman Larry Gardner had a good season (better than Hooper’s), and Smokey Joe Wood won 30 games. Was Walter Johnson a fluke? 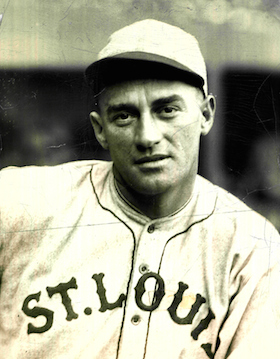 After three so-so seasons, Johnson put together two 20 win seasons in 1910 and 1911. Fans had to wonder if he could continue. Short answer? Yes. After hitting .400 in 1911, could Ty Cobb do it again? Again the answer turned out to be yes. After hitting .400 in 1911 and losing the batting title to Cobb, could new guy Joe Jackson hit .400 in 1912 and win the batting title? Jackson slipped to .395, but led the AL in triples. Would the team in New York, which had finished second in 1910 and slipped back to sixth in 1911 under now ousted manager Hal Chase recover or continue to slide. They dropped all the way to last place in 1912 with Chase still at first and sulking (among other things). He did lead the team in RBIs with 58. And finally would Chicago pitcher Ed Walsh’s arm fall off? Walsh led the AL in games pitched in 1907, 1908, 1910, and 1911. Could he do it again? He could. He pitched in 62 games, starting 41, completing 32, and pitching 393 innings (read that last number closely). Apparently the arm stayed attached, but the toll finally got to him. He developed a sore arm in 1913 and his career was effectively over. Part of the joy of baseball is actually the offseason. The speculation, the anticipation, the questioning all make for a lot of fun. 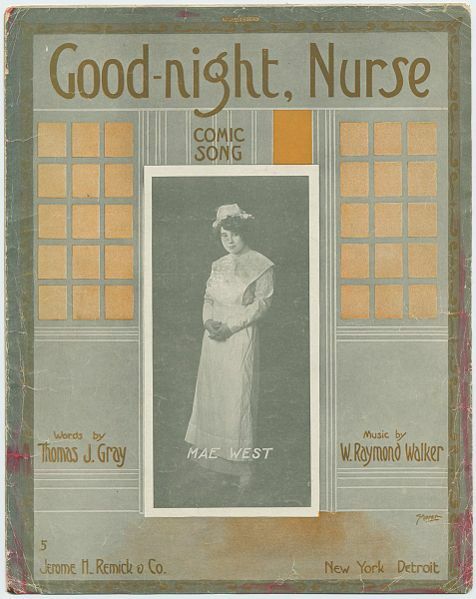 I love it, I hope you love it, and I’m sure fans 100 years ago loved it too.